Swap The Box is a box sliding puzzle game. You have to swap the boxes until they are 3 on a row or column, if the boxes are aligned they will disappear. The goal of Swap the Box is to make all the boxes in the level disappear. You have a limited amount of moves, so you have to chose wisely what box to swap. If you can't solve Level 24 from Train Pack you are in the right place, just look at the image above to see the correct solution. Swap The Box [Train] Level 24 Answer, Cheats, Solution for Android, iPhone, iPad, iPod. Swap The Box is a box sliding puzzle game. You have to swap the boxes until they are 3 on a row or column, if the boxes are aligned they will disappear. The goal of Swap the Box is to make all the boxes in the level disappear. You have a limited amount of moves, so you have to chose wisely what box to swap. 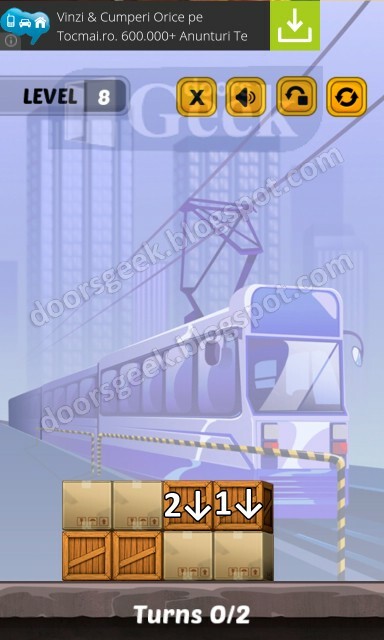 If you can't solve Level 23 from Train Pack you are in the right place, just look at the image above to see the correct solution. Swap The Box [Train] Level 23 Answer, Cheats, Solution for Android, iPhone, iPad, iPod. Swap The Box is a box sliding puzzle game. You have to swap the boxes until they are 3 on a row or column, if the boxes are aligned they will disappear. The goal of Swap the Box is to make all the boxes in the level disappear. You have a limited amount of moves, so you have to chose wisely what box to swap. If you can't solve Level 22 from Train Pack you are in the right place, just look at the image above to see the correct solution. 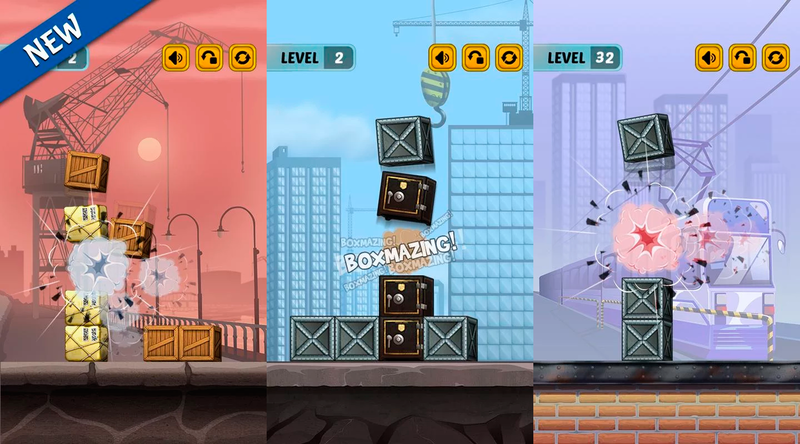 Swap The Box [Train] Level 22 Answer, Cheats, Solution for Android, iPhone, iPad, iPod. Swap The Box is a box sliding puzzle game. You have to swap the boxes until they are 3 on a row or column, if the boxes are aligned they will disappear. The goal of Swap the Box is to make all the boxes in the level disappear. You have a limited amount of moves, so you have to chose wisely what box to swap. If you can't solve Level 21 from Train Pack you are in the right place, just look at the image above to see the correct solution. 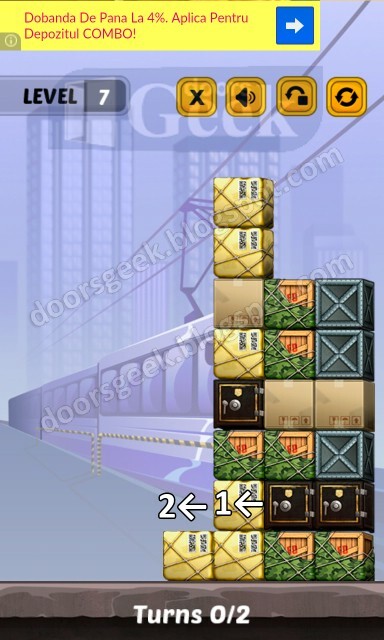 Swap The Box [Train] Level 21 Answer, Cheats, Solution for Android, iPhone, iPad, iPod. Swap The Box is a box sliding puzzle game. You have to swap the boxes until they are 3 on a row or column, if the boxes are aligned they will disappear. The goal of Swap the Box is to make all the boxes in the level disappear. You have a limited amount of moves, so you have to chose wisely what box to swap. If you can't solve Level 20 from Train Pack you are in the right place, just look at the image above to see the correct solution. 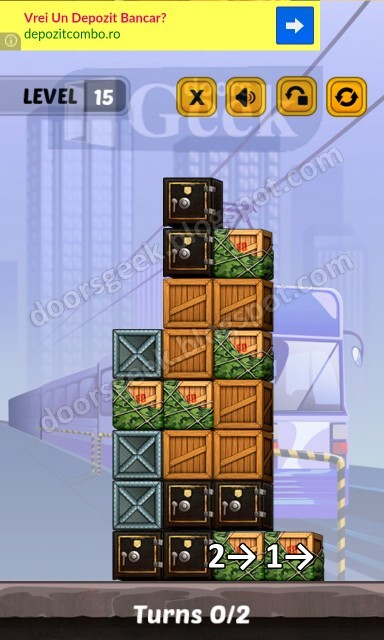 Swap The Box [Train] Level 20 Answer, Cheats, Solution for Android, iPhone, iPad, iPod. Swap The Box is a box sliding puzzle game. You have to swap the boxes until they are 3 on a row or column, if the boxes are aligned they will disappear. The goal of Swap the Box is to make all the boxes in the level disappear. You have a limited amount of moves, so you have to chose wisely what box to swap. If you can't solve Level 19 from Train Pack you are in the right place, just look at the image above to see the correct solution. 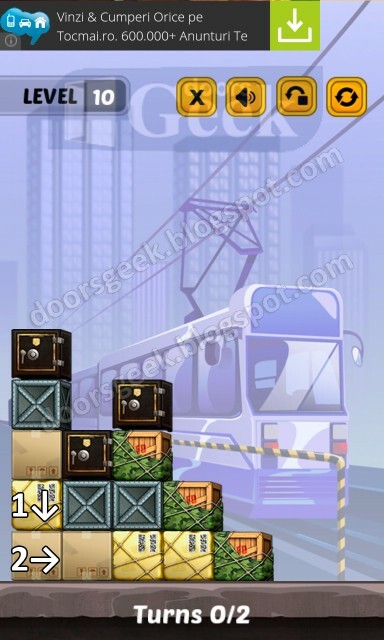 Swap The Box [Train] Level 19 Answer, Cheats, Solution for Android, iPhone, iPad, iPod. Swap The Box is a box sliding puzzle game. You have to swap the boxes until they are 3 on a row or column, if the boxes are aligned they will disappear. The goal of Swap the Box is to make all the boxes in the level disappear. You have a limited amount of moves, so you have to chose wisely what box to swap. If you can't solve Level 18 from Train Pack you are in the right place, just look at the image above to see the correct solution. Swap The Box [Train] Level 18 Answer, Cheats, Solution for Android, iPhone, iPad, iPod. Swap The Box is a box sliding puzzle game. You have to swap the boxes until they are 3 on a row or column, if the boxes are aligned they will disappear. The goal of Swap the Box is to make all the boxes in the level disappear. You have a limited amount of moves, so you have to chose wisely what box to swap. If you can't solve Level 17 from Train Pack you are in the right place, just look at the image above to see the correct solution. Swap The Box [Train] Level 17 Answer, Cheats, Solution for Android, iPhone, iPad, iPod. Swap The Box is a box sliding puzzle game. You have to swap the boxes until they are 3 on a row or column, if the boxes are aligned they will disappear. The goal of Swap the Box is to make all the boxes in the level disappear. You have a limited amount of moves, so you have to chose wisely what box to swap. If you can't solve Level 16 from Train Pack you are in the right place, just look at the image above to see the correct solution. 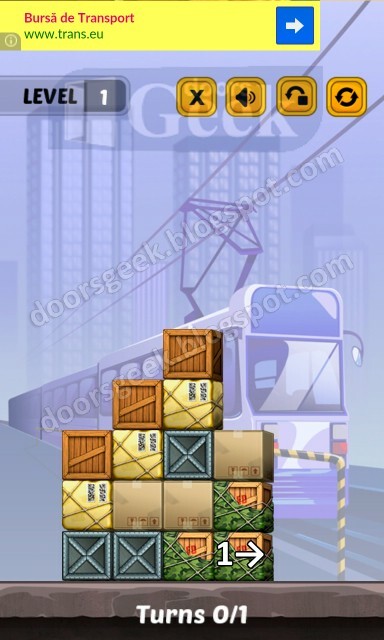 Swap The Box [Train] Level 16 Answer, Cheats, Solution for Android, iPhone, iPad, iPod. Swap The Box is a box sliding puzzle game. You have to swap the boxes until they are 3 on a row or column, if the boxes are aligned they will disappear. The goal of Swap the Box is to make all the boxes in the level disappear. You have a limited amount of moves, so you have to chose wisely what box to swap. If you can't solve Level 15 from Train Pack you are in the right place, just look at the image above to see the correct solution. Swap The Box [Train] Level 15 Answer, Cheats, Solution for Android, iPhone, iPad, iPod. Swap The Box is a box sliding puzzle game. You have to swap the boxes until they are 3 on a row or column, if the boxes are aligned they will disappear. The goal of Swap the Box is to make all the boxes in the level disappear. You have a limited amount of moves, so you have to chose wisely what box to swap. If you can't solve Level 14 from Train Pack you are in the right place, just look at the image above to see the correct solution. 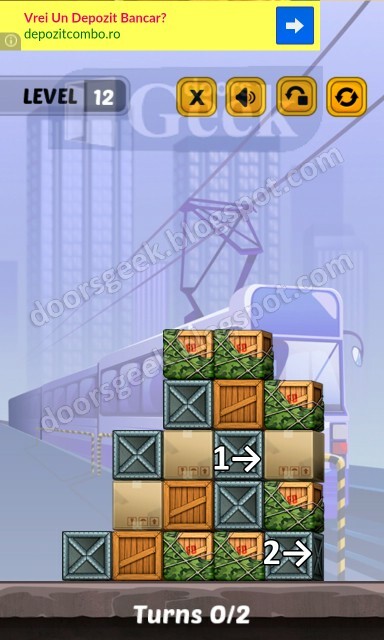 Swap The Box [Train] Level 14 Answer, Cheats, Solution for Android, iPhone, iPad, iPod. Swap The Box is a box sliding puzzle game. You have to swap the boxes until they are 3 on a row or column, if the boxes are aligned they will disappear. The goal of Swap the Box is to make all the boxes in the level disappear. You have a limited amount of moves, so you have to chose wisely what box to swap. If you can't solve Level 13 from Train Pack you are in the right place, just look at the image above to see the correct solution. 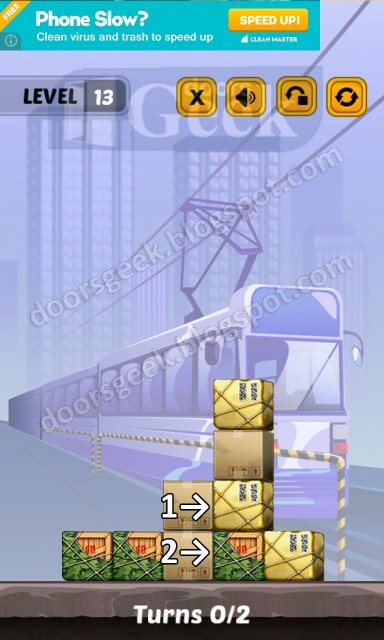 Swap The Box [Train] Level 13 Answer, Cheats, Solution for Android, iPhone, iPad, iPod. Swap The Box is a box sliding puzzle game. You have to swap the boxes until they are 3 on a row or column, if the boxes are aligned they will disappear. The goal of Swap the Box is to make all the boxes in the level disappear. You have a limited amount of moves, so you have to chose wisely what box to swap. 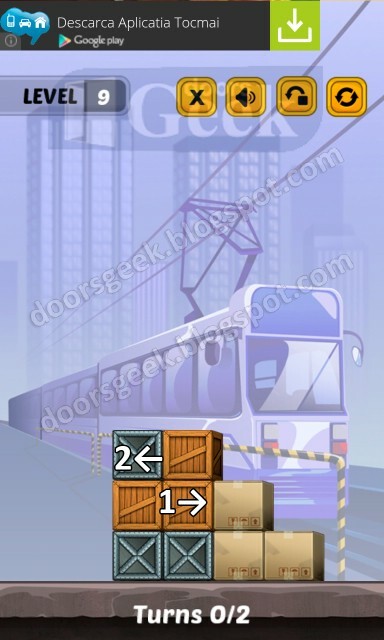 If you can't solve Level 12 from Train Pack you are in the right place, just look at the image above to see the correct solution. 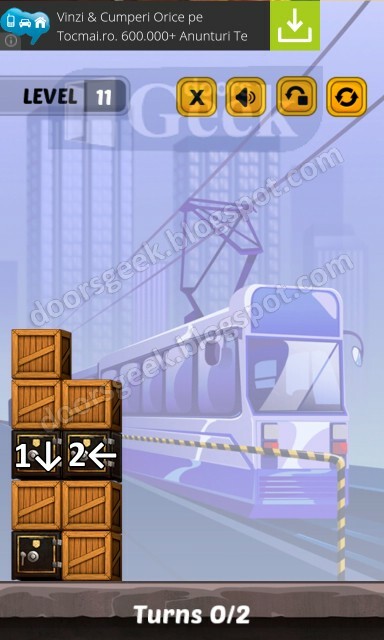 Swap The Box [Train] Level 12 Answer, Cheats, Solution for Android, iPhone, iPad, iPod. Swap The Box is a box sliding puzzle game. You have to swap the boxes until they are 3 on a row or column, if the boxes are aligned they will disappear. The goal of Swap the Box is to make all the boxes in the level disappear. You have a limited amount of moves, so you have to chose wisely what box to swap. 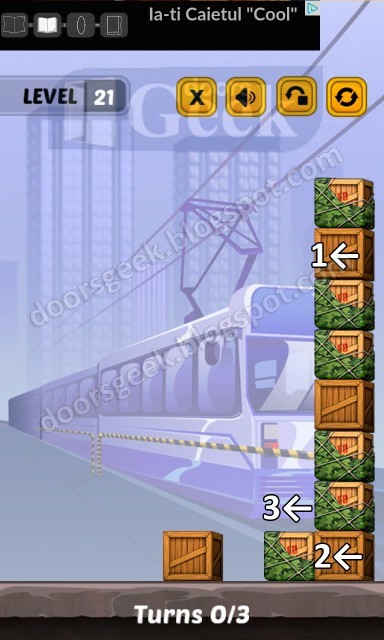 If you can't solve Level 11 from Train Pack you are in the right place, just look at the image above to see the correct solution. 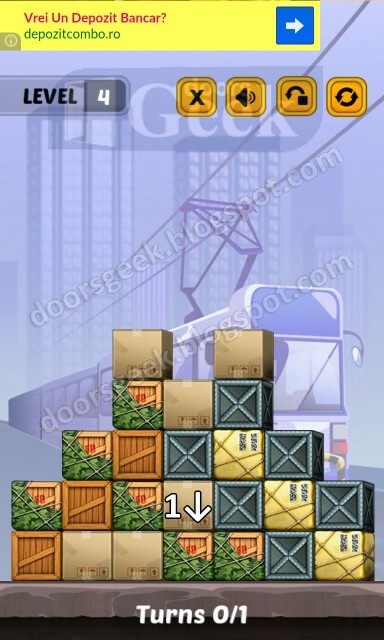 Swap The Box [Train] Level 11 Answer, Cheats, Solution for Android, iPhone, iPad, iPod. Swap The Box is a box sliding puzzle game. You have to swap the boxes until they are 3 on a row or column, if the boxes are aligned they will disappear. The goal of Swap the Box is to make all the boxes in the level disappear. You have a limited amount of moves, so you have to chose wisely what box to swap. 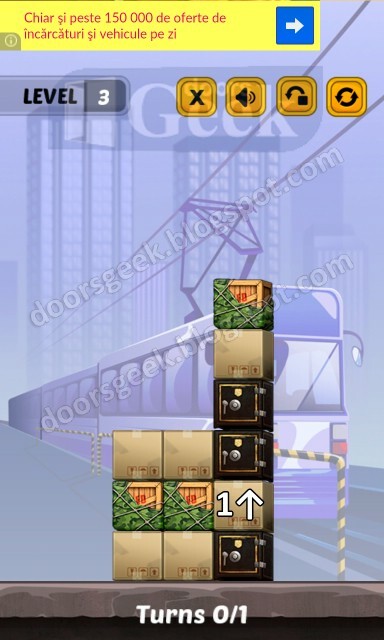 If you can't solve Level 10 from Train Pack you are in the right place, just look at the image above to see the correct solution. 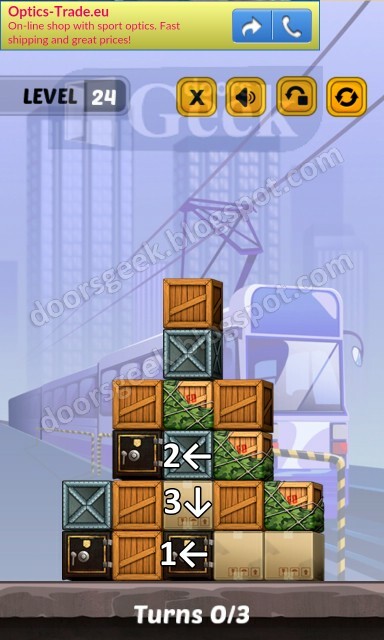 Swap The Box [Train] Level 10 Answer, Cheats, Solution for Android, iPhone, iPad, iPod. Swap The Box is a box sliding puzzle game. You have to swap the boxes until they are 3 on a row or column, if the boxes are aligned they will disappear. The goal of Swap the Box is to make all the boxes in the level disappear. You have a limited amount of moves, so you have to chose wisely what box to swap. 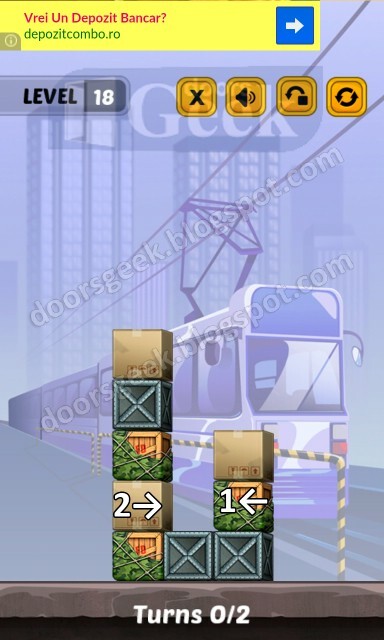 If you can't solve Level 9 from Train Pack you are in the right place, just look at the image above to see the correct solution. 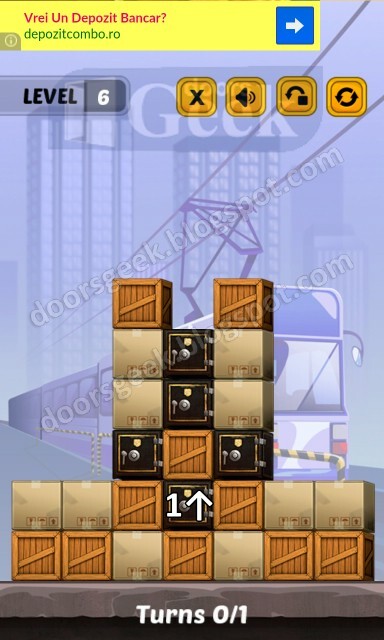 Swap The Box [Train] Level 9 Answer, Cheats, Solution for Android, iPhone, iPad, iPod. Swap The Box is a box sliding puzzle game. You have to swap the boxes until they are 3 on a row or column, if the boxes are aligned they will disappear. The goal of Swap the Box is to make all the boxes in the level disappear. You have a limited amount of moves, so you have to chose wisely what box to swap. If you can't solve Level 8 from Train Pack you are in the right place, just look at the image above to see the correct solution. Swap The Box [Train] Level 8 Answer, Cheats, Solution for Android, iPhone, iPad, iPod. Swap The Box is a box sliding puzzle game. You have to swap the boxes until they are 3 on a row or column, if the boxes are aligned they will disappear. The goal of Swap the Box is to make all the boxes in the level disappear. You have a limited amount of moves, so you have to chose wisely what box to swap. If you can't solve Level 7 from Train Pack you are in the right place, just look at the image above to see the correct solution. 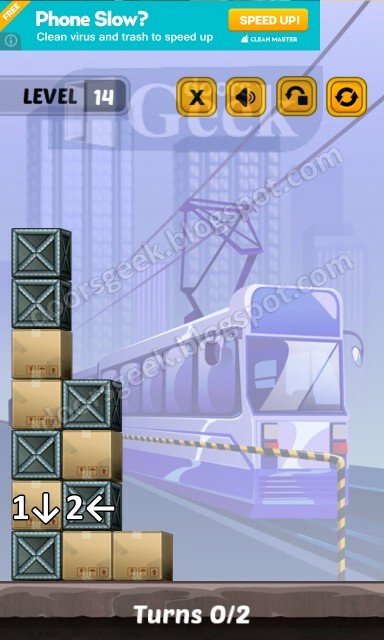 Swap The Box [Train] Level 7 Answer, Cheats, Solution for Android, iPhone, iPad, iPod. Swap The Box is a box sliding puzzle game. You have to swap the boxes until they are 3 on a row or column, if the boxes are aligned they will disappear. The goal of Swap the Box is to make all the boxes in the level disappear. You have a limited amount of moves, so you have to chose wisely what box to swap. If you can't solve Level 6 from Train Pack you are in the right place, just look at the image above to see the correct solution. Swap The Box [Train] Level 6 Answer, Cheats, Solution for Android, iPhone, iPad, iPod. Swap The Box is a box sliding puzzle game. You have to swap the boxes until they are 3 on a row or column, if the boxes are aligned they will disappear. The goal of Swap the Box is to make all the boxes in the level disappear. You have a limited amount of moves, so you have to chose wisely what box to swap. If you can't solve Level 5 from Train Pack you are in the right place, just look at the image above to see the correct solution. Swap The Box [Train] Level 5 Answer, Cheats, Solution for Android, iPhone, iPad, iPod. Swap The Box is a box sliding puzzle game. You have to swap the boxes until they are 3 on a row or column, if the boxes are aligned they will disappear. The goal of Swap the Box is to make all the boxes in the level disappear. You have a limited amount of moves, so you have to chose wisely what box to swap. If you can't solve Level 4 from Train Pack you are in the right place, just look at the image above to see the correct solution. Swap The Box [Train] Level 4 Answer, Cheats, Solution for Android, iPhone, iPad, iPod. Swap The Box is a box sliding puzzle game. You have to swap the boxes until they are 3 on a row or column, if the boxes are aligned they will disappear. The goal of Swap the Box is to make all the boxes in the level disappear. You have a limited amount of moves, so you have to chose wisely what box to swap. If you can't solve Level 3 from Train Pack you are in the right place, just look at the image above to see the correct solution. Swap The Box [Train] Level 3 Answer, Cheats, Solution for Android, iPhone, iPad, iPod. Swap The Box is a box sliding puzzle game. You have to swap the boxes until they are 3 on a row or column, if the boxes are aligned they will disappear. The goal of Swap the Box is to make all the boxes in the level disappear. You have a limited amount of moves, so you have to chose wisely what box to swap. If you can't solve Level 2 from Train Pack you are in the right place, just look at the image above to see the correct solution. Swap The Box [Train] Level 2 Answer, Cheats, Solution for Android, iPhone, iPad, iPod. Swap The Box is a box sliding puzzle game. You have to swap the boxes until they are 3 on a row or column, if the boxes are aligned they will disappear. The goal of Swap the Box is to make all the boxes in the level disappear. You have a limited amount of moves, so you have to chose wisely what box to swap. If you can't solve Level 1 from Train Pack you are in the right place, just look at the image above to see the correct solution. Swap The Box [Train] Level 1 Answer, Cheats, Solution for Android, iPhone, iPad, iPod. Swap The Box is a box sliding puzzle game. You have to swap the boxes until they are 3 on a row or column, if the boxes are aligned they will disappear. The goal of Swap the Box is to make all the boxes in the level disappear. You have a limited amount of moves, so you have to chose wisely what box to swap. If you can't solve Level 24 from Docks Pack you are in the right place, just look at the image above to see the correct solution. 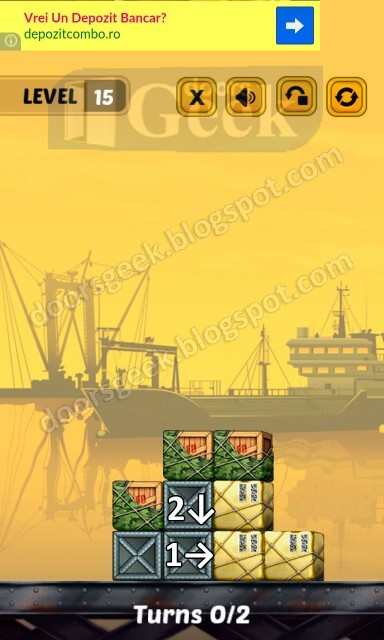 Swap The Box [Docks] Level 24 Answer, Cheats, Solution for Android, iPhone, iPad, iPod. Swap The Box is a box sliding puzzle game. You have to swap the boxes until they are 3 on a row or column, if the boxes are aligned they will disappear. The goal of Swap the Box is to make all the boxes in the level disappear. You have a limited amount of moves, so you have to chose wisely what box to swap. If you can't solve Level 23 from Docks Pack you are in the right place, just look at the image above to see the correct solution. 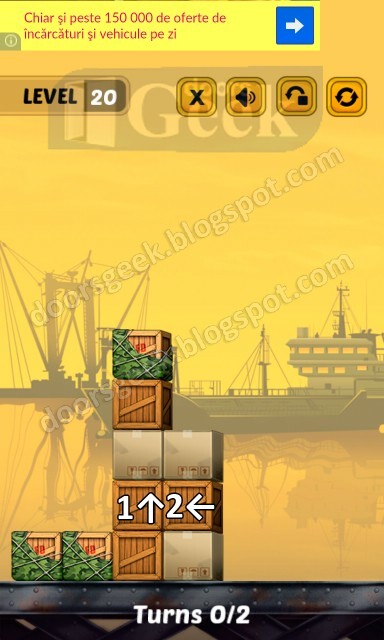 Swap The Box [Docks] Level 23 Answer, Cheats, Solution for Android, iPhone, iPad, iPod. Swap The Box is a box sliding puzzle game. You have to swap the boxes until they are 3 on a row or column, if the boxes are aligned they will disappear. The goal of Swap the Box is to make all the boxes in the level disappear. You have a limited amount of moves, so you have to chose wisely what box to swap. If you can't solve Level 22 from Docks Pack you are in the right place, just look at the image above to see the correct solution. 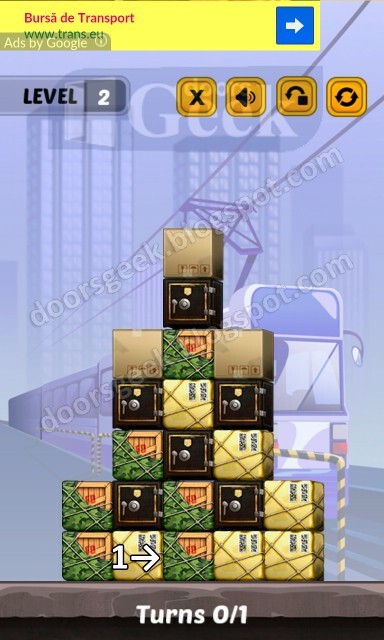 Swap The Box [Docks] Level 22 Answer, Cheats, Solution for Android, iPhone, iPad, iPod. Swap The Box is a box sliding puzzle game. You have to swap the boxes until they are 3 on a row or column, if the boxes are aligned they will disappear. The goal of Swap the Box is to make all the boxes in the level disappear. You have a limited amount of moves, so you have to chose wisely what box to swap. If you can't solve Level 21 from Docks Pack you are in the right place, just look at the image above to see the correct solution. 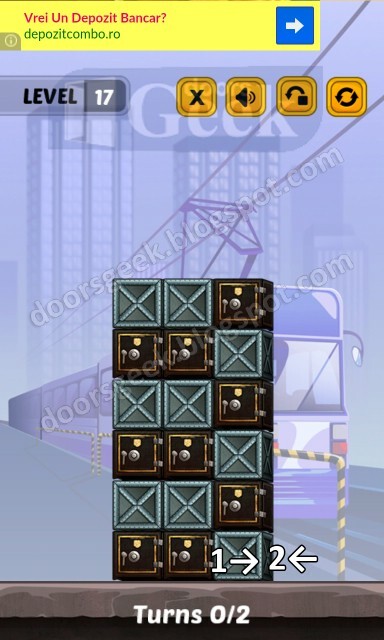 Swap The Box [Docks] Level 21 Answer, Cheats, Solution for Android, iPhone, iPad, iPod. Swap The Box is a box sliding puzzle game. You have to swap the boxes until they are 3 on a row or column, if the boxes are aligned they will disappear. The goal of Swap the Box is to make all the boxes in the level disappear. You have a limited amount of moves, so you have to chose wisely what box to swap. If you can't solve Level 20 from Docks Pack you are in the right place, just look at the image above to see the correct solution. 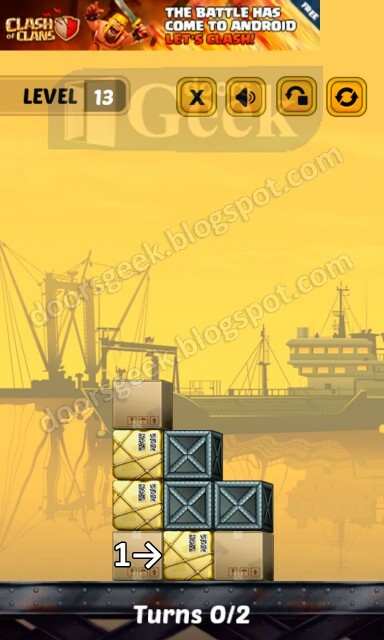 Swap The Box [Docks] Level 20 Answer, Cheats, Solution for Android, iPhone, iPad, iPod. Swap The Box is a box sliding puzzle game. You have to swap the boxes until they are 3 on a row or column, if the boxes are aligned they will disappear. The goal of Swap the Box is to make all the boxes in the level disappear. You have a limited amount of moves, so you have to chose wisely what box to swap. If you can't solve Level 19 from Docks Pack you are in the right place, just look at the image above to see the correct solution. 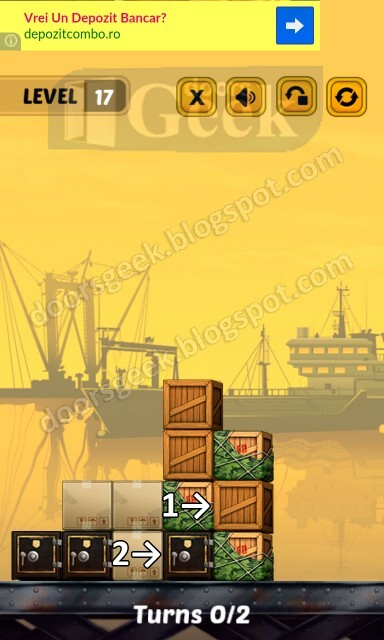 Swap The Box [Docks] Level 19 Answer, Cheats, Solution for Android, iPhone, iPad, iPod. Swap The Box is a box sliding puzzle game. You have to swap the boxes until they are 3 on a row or column, if the boxes are aligned they will disappear. The goal of Swap the Box is to make all the boxes in the level disappear. You have a limited amount of moves, so you have to chose wisely what box to swap. If you can't solve Level 18 from Docks Pack you are in the right place, just look at the image above to see the correct solution. 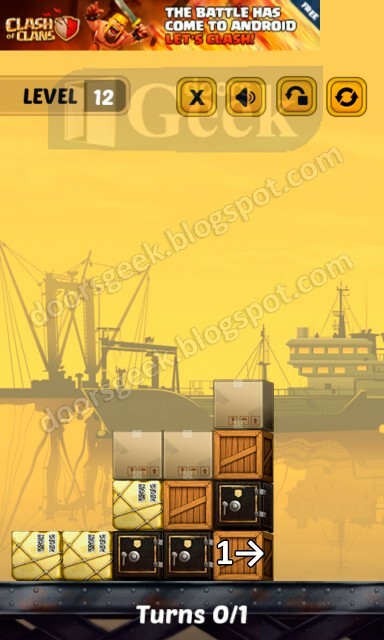 Swap The Box [Docks] Level 18 Answer, Cheats, Solution for Android, iPhone, iPad, iPod. Swap The Box is a box sliding puzzle game. You have to swap the boxes until they are 3 on a row or column, if the boxes are aligned they will disappear. The goal of Swap the Box is to make all the boxes in the level disappear. You have a limited amount of moves, so you have to chose wisely what box to swap. If you can't solve Level 17 from Docks Pack you are in the right place, just look at the image above to see the correct solution. 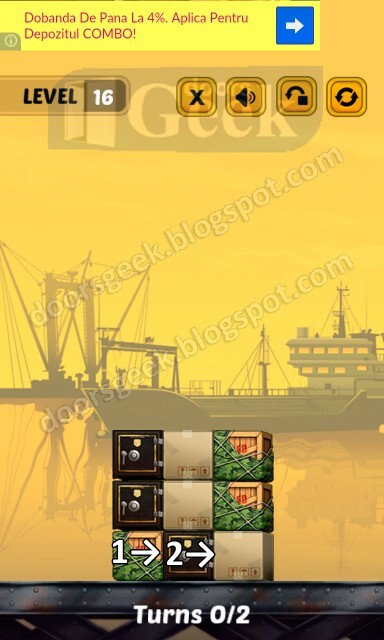 Swap The Box [Docks] Level 17 Answer, Cheats, Solution for Android, iPhone, iPad, iPod. Swap The Box is a box sliding puzzle game. You have to swap the boxes until they are 3 on a row or column, if the boxes are aligned they will disappear. The goal of Swap the Box is to make all the boxes in the level disappear. You have a limited amount of moves, so you have to chose wisely what box to swap. If you can't solve Level 16 from Docks Pack you are in the right place, just look at the image above to see the correct solution. 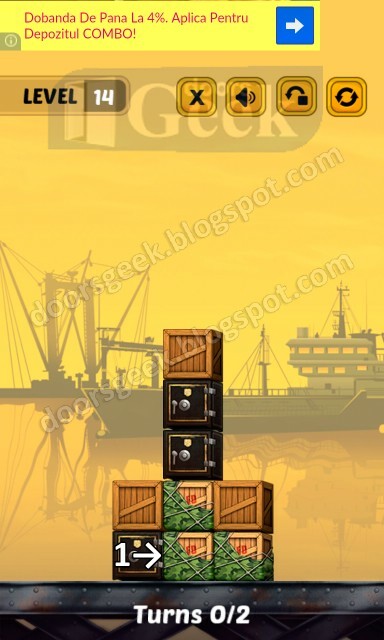 Swap The Box [Docks] Level 16 Answer, Cheats, Solution for Android, iPhone, iPad, iPod. Swap The Box is a box sliding puzzle game. You have to swap the boxes until they are 3 on a row or column, if the boxes are aligned they will disappear. The goal of Swap the Box is to make all the boxes in the level disappear. You have a limited amount of moves, so you have to chose wisely what box to swap. If you can't solve Level 15 from Docks Pack you are in the right place, just look at the image above to see the correct solution. 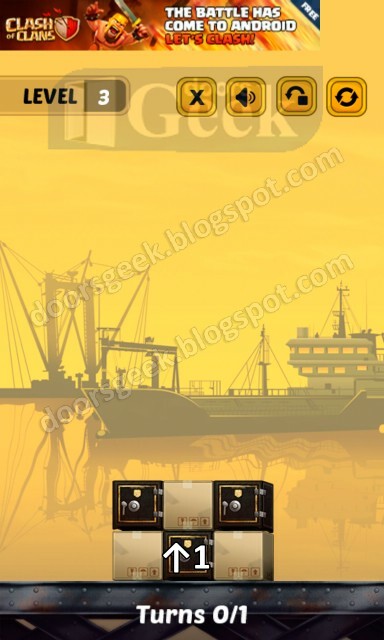 Swap The Box [Docks] Level 15 Answer, Cheats, Solution for Android, iPhone, iPad, iPod. Swap The Box is a box sliding puzzle game. You have to swap the boxes until they are 3 on a row or column, if the boxes are aligned they will disappear. The goal of Swap the Box is to make all the boxes in the level disappear. You have a limited amount of moves, so you have to chose wisely what box to swap. 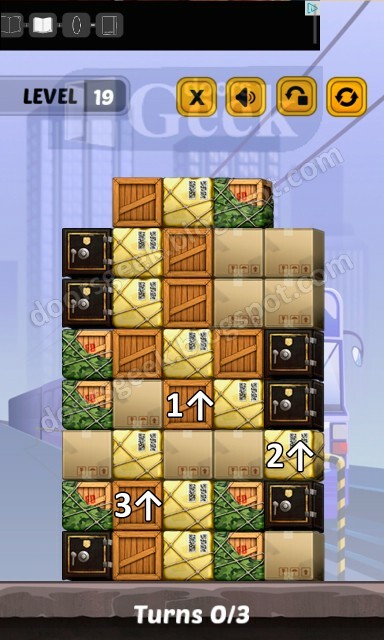 If you can't solve Level 14 from Docks Pack you are in the right place, just look at the image above to see the correct solution. 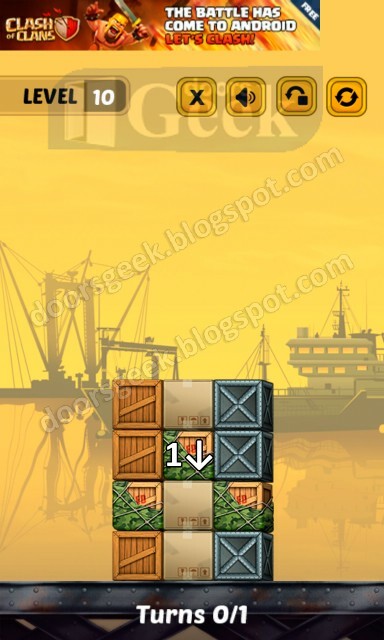 Swap The Box [Docks] Level 14 Answer, Cheats, Solution for Android, iPhone, iPad, iPod. Swap The Box is a box sliding puzzle game. You have to swap the boxes until they are 3 on a row or column, if the boxes are aligned they will disappear. The goal of Swap the Box is to make all the boxes in the level disappear. You have a limited amount of moves, so you have to chose wisely what box to swap. 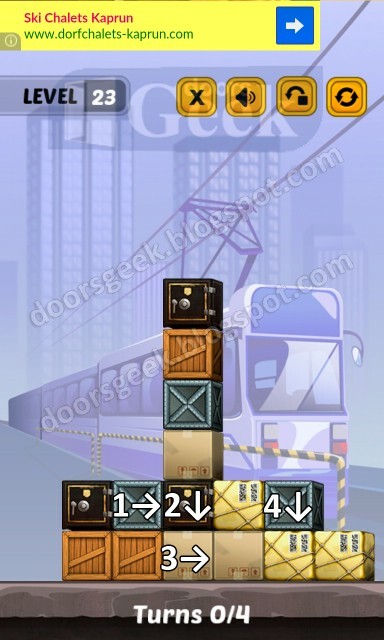 If you can't solve Level 13 from Docks Pack you are in the right place, just look at the image above to see the correct solution. 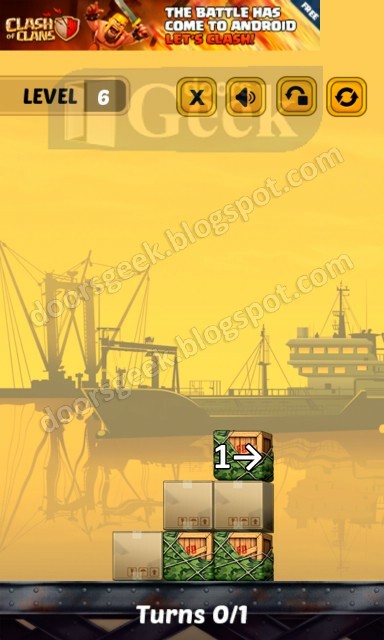 Swap The Box [Docks] Level 13 Answer, Cheats, Solution for Android, iPhone, iPad, iPod. Swap The Box is a box sliding puzzle game. You have to swap the boxes until they are 3 on a row or column, if the boxes are aligned they will disappear. The goal of Swap the Box is to make all the boxes in the level disappear. You have a limited amount of moves, so you have to chose wisely what box to swap. If you can't solve Level 12 from Docks Pack you are in the right place, just look at the image above to see the correct solution. 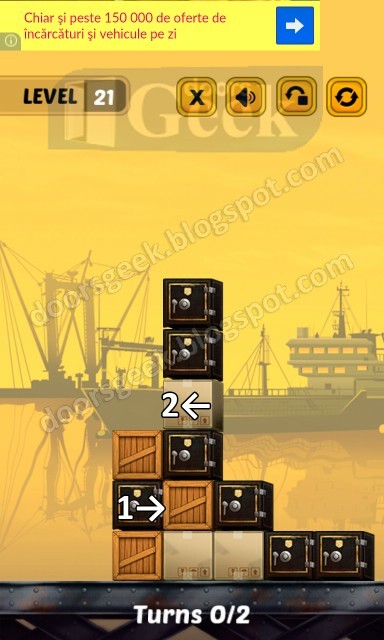 Swap The Box [Docks] Level 12 Answer, Cheats, Solution for Android, iPhone, iPad, iPod. Swap The Box is a box sliding puzzle game. You have to swap the boxes until they are 3 on a row or column, if the boxes are aligned they will disappear. The goal of Swap the Box is to make all the boxes in the level disappear. You have a limited amount of moves, so you have to chose wisely what box to swap. 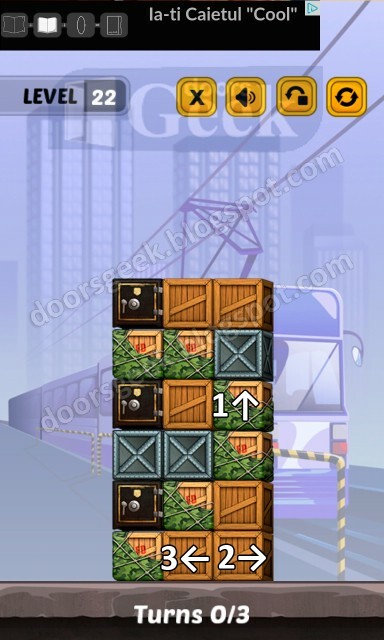 If you can't solve Level 11 from Docks Pack you are in the right place, just look at the image above to see the correct solution. 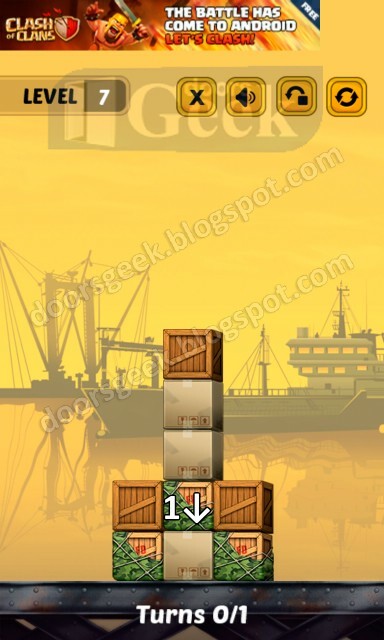 Swap The Box [Docks] Level 11 Answer, Cheats, Solution for Android, iPhone, iPad, iPod. Swap The Box is a box sliding puzzle game. You have to swap the boxes until they are 3 on a row or column, if the boxes are aligned they will disappear. The goal of Swap the Box is to make all the boxes in the level disappear. You have a limited amount of moves, so you have to chose wisely what box to swap. 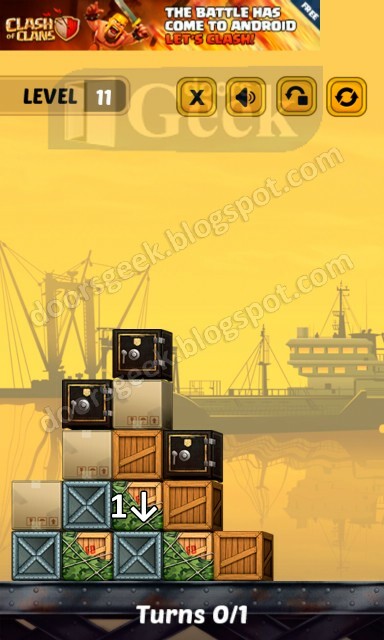 If you can't solve Level 10 from Docks Pack you are in the right place, just look at the image above to see the correct solution. 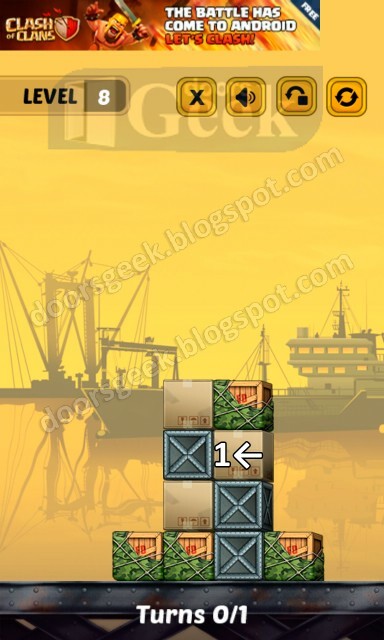 Swap The Box [Docks] Level 10 Answer, Cheats, Solution for Android, iPhone, iPad, iPod. Swap The Box is a box sliding puzzle game. You have to swap the boxes until they are 3 on a row or column, if the boxes are aligned they will disappear. The goal of Swap the Box is to make all the boxes in the level disappear. You have a limited amount of moves, so you have to chose wisely what box to swap. If you can't solve Level 9 from Docks Pack you are in the right place, just look at the image above to see the correct solution. 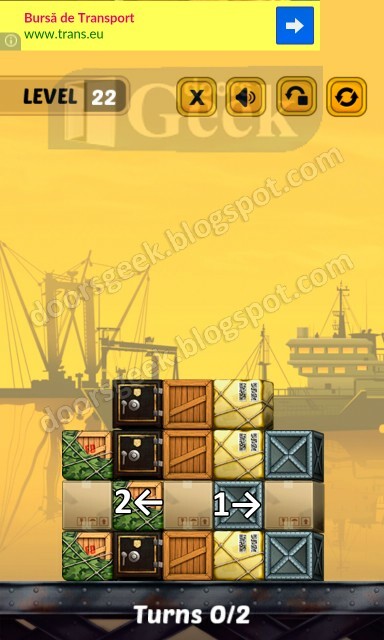 Swap The Box [Docks] Level 9 Answer, Cheats, Solution for Android, iPhone, iPad, iPod. Swap The Box is a box sliding puzzle game. You have to swap the boxes until they are 3 on a row or column, if the boxes are aligned they will disappear. The goal of Swap the Box is to make all the boxes in the level disappear. You have a limited amount of moves, so you have to chose wisely what box to swap. If you can't solve Level 8 from Docks Pack you are in the right place, just look at the image above to see the correct solution. 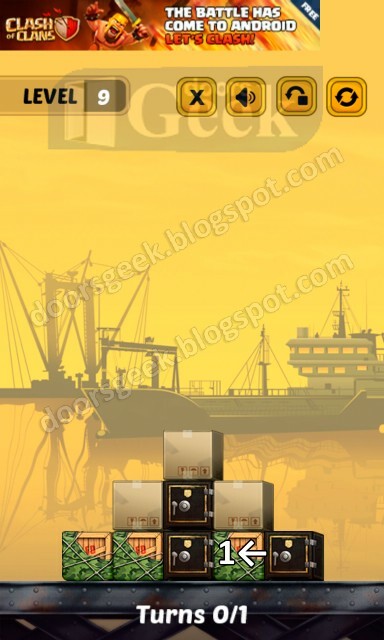 Swap The Box [Docks] Level 8 Answer, Cheats, Solution for Android, iPhone, iPad, iPod. Swap The Box is a box sliding puzzle game. You have to swap the boxes until they are 3 on a row or column, if the boxes are aligned they will disappear. The goal of Swap the Box is to make all the boxes in the level disappear. You have a limited amount of moves, so you have to chose wisely what box to swap. If you can't solve Level 7 from Docks Pack you are in the right place, just look at the image above to see the correct solution. 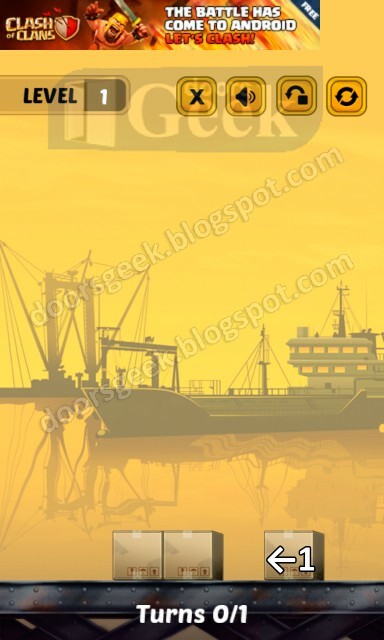 Swap The Box [Docks] Level 7 Answer, Cheats, Solution for Android, iPhone, iPad, iPod. Swap The Box is a box sliding puzzle game. You have to swap the boxes until they are 3 on a row or column, if the boxes are aligned they will disappear. The goal of Swap the Box is to make all the boxes in the level disappear. You have a limited amount of moves, so you have to chose wisely what box to swap. If you can't solve Level 6 from Docks Pack you are in the right place, just look at the image above to see the correct solution. 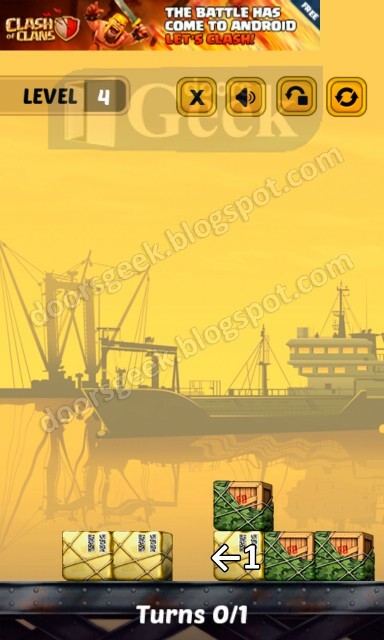 Swap The Box [Docks] Level 6 Answer, Cheats, Solution for Android, iPhone, iPad, iPod. Swap The Box is a box sliding puzzle game. You have to swap the boxes until they are 3 on a row or column, if the boxes are aligned they will disappear. The goal of Swap the Box is to make all the boxes in the level disappear. You have a limited amount of moves, so you have to chose wisely what box to swap. If you can't solve Level 5 from Docks Pack you are in the right place, just look at the image above to see the correct solution. 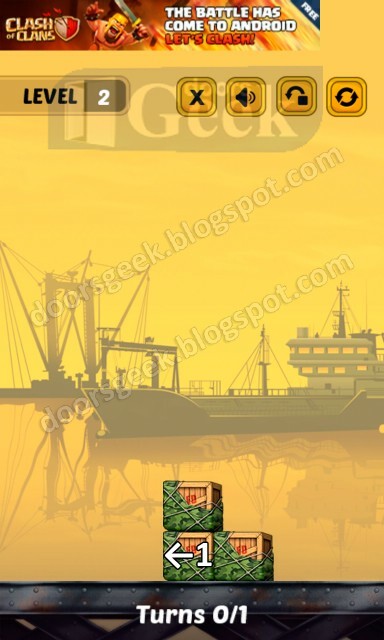 Swap The Box [Docks] Level 5 Answer, Cheats, Solution for Android, iPhone, iPad, iPod. Swap The Box is a box sliding puzzle game. You have to swap the boxes until they are 3 on a row or column, if the boxes are aligned they will disappear. The goal of Swap the Box is to make all the boxes in the level disappear. You have a limited amount of moves, so you have to chose wisely what box to swap. If you can't solve Level 4 from Docks Pack you are in the right place, just look at the image above to see the correct solution. 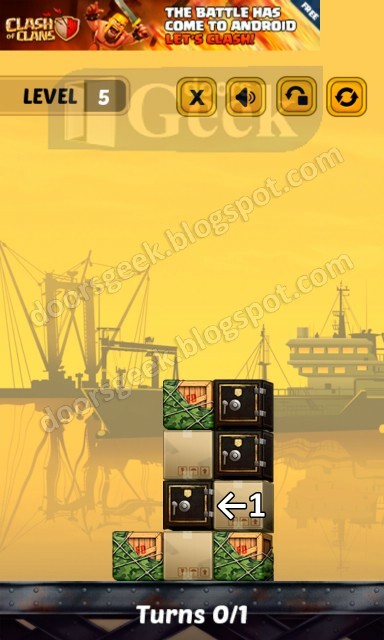 Swap The Box [Docks] Level 4 Answer, Cheats, Solution for Android, iPhone, iPad, iPod. Swap The Box is a box sliding puzzle game. You have to swap the boxes until they are 3 on a row or column, if the boxes are aligned they will disappear. The goal of Swap the Box is to make all the boxes in the level disappear. You have a limited amount of moves, so you have to chose wisely what box to swap. If you can't solve Level 3 from Docks Pack you are in the right place, just look at the image above to see the correct solution. 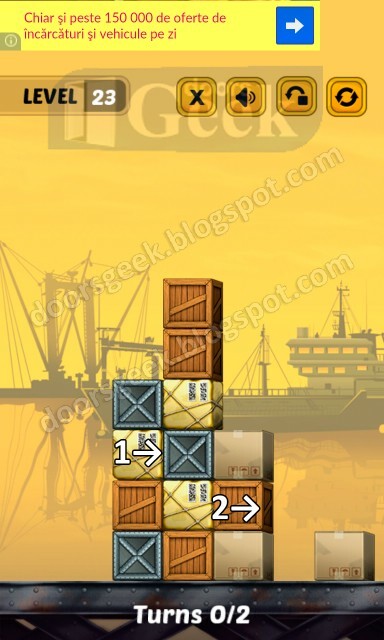 Swap The Box [Docks] Level 3 Answer, Cheats, Solution for Android, iPhone, iPad, iPod. Swap The Box is a box sliding puzzle game. You have to swap the boxes until they are 3 on a row or column, if the boxes are aligned they will disappear. The goal of Swap the Box is to make all the boxes in the level disappear. You have a limited amount of moves, so you have to chose wisely what box to swap. If you can't solve Level 2 from Docks Pack you are in the right place, just look at the image above to see the correct solution. 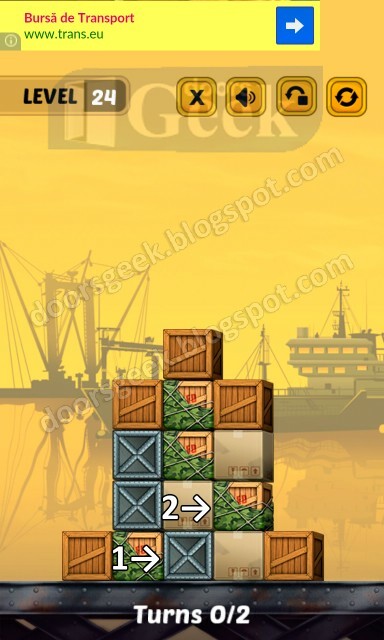 Swap The Box [Docks] Level 2 Answer, Cheats, Solution for Android, iPhone, iPad, iPod. Swap The Box is a box sliding puzzle game. You have to swap the boxes until they are 3 on a row or column, if the boxes are aligned they will disappear. The goal of Swap the Box is to make all the boxes in the level disappear. You have a limited amount of moves, so you have to chose wisely what box to swap. 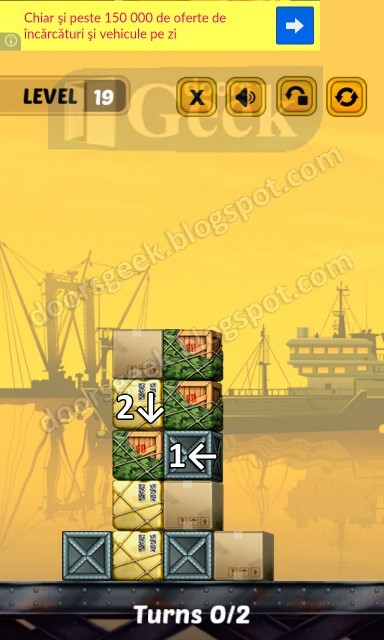 If you can't solve Level 1 from Docks Pack you are in the right place, just look at the image above to see the correct solution. 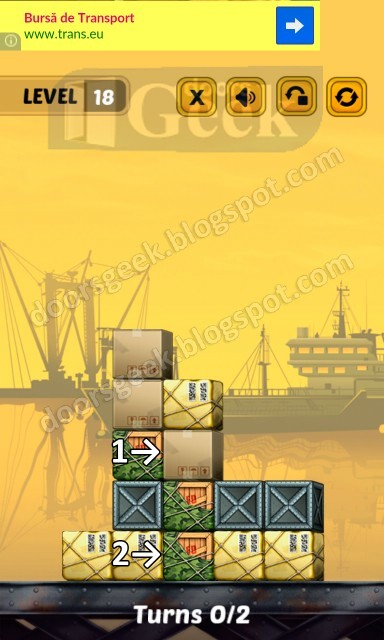 Swap The Box [Docks] Level 1 Answer, Cheats, Solution for Android, iPhone, iPad, iPod. Swap The Box is a box sliding puzzle game made by GameVille Studio Inc.. You have to swap the boxes until they are 3 on a row or column, if the boxes are aligned they will disappear. The goal of Swap the Box is to make all the boxes in the level disappear. You have a limited amount of moves, so you have to chose wisely what box to swap. If you can't solve a certain level of Swap the Box you are in the right place, just chose the level you are stuck at and you will find the correct solution to solve it. 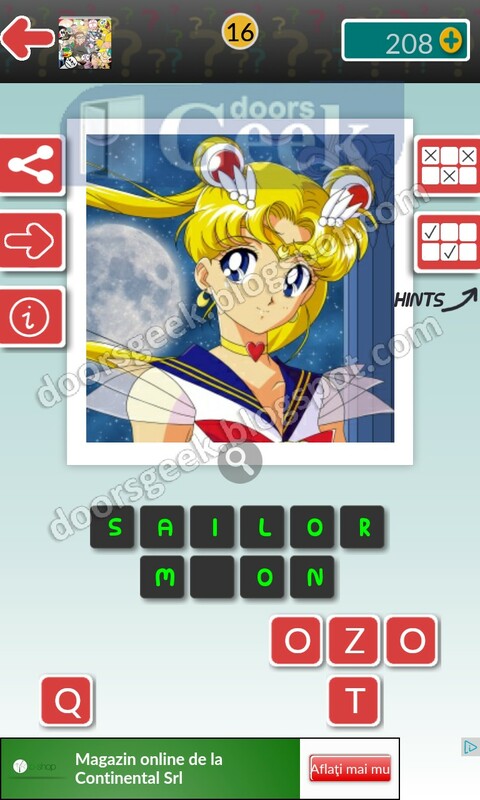 Guess The Character : Cartoon [Level 38-16] Answer, Cheats, Solution for Android, iPhone, iPad, iPod.